Yosemite National Park is not just an amazing valley, it's a testament to human foresight, the strength of glaciers, the toughness of granite, the perseverance of life, and the serenity of the High Sierra. The Yosemite Valley area was first protected in 1864, and is known for its beautiful waterfalls. 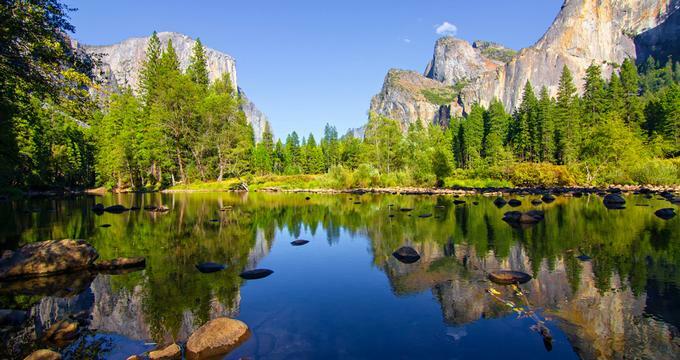 Yosemite National Park, CA spans almost 1,200 square miles, containing vast meadows, deep valleys, ancient giant sequoias, grand wilderness areas, and rock formations. 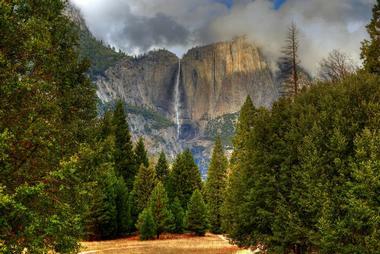 Almost 95% of Yosemite National Park is congressionally designated wilderness. Numerous waterfalls can be found throughout Yosemite National Park. The best time to see most of these waterfalls is spring, which is the time of the majority of snowmelt. May or June is usually when peak runoff occurs, with some of the waterfalls only trickling or completely drying up by August. Visitors can spot Yosemite Falls by the roaring runoff during April to June or the ice cone at the base of the upper fall during winter in winter. Yosemite Falls is among the tallest waterfalls in the world and is actually made up of three separate falls: Upper Yosemite Fall, middle cascades, and Lower Yosemite Fall. Hikers can reach the top of the waterfall by an all-day, strenuous hike. Found on the south side of Yosemite Valley and west of Sentinel Rock, Sentinel Falls is made up of several cascades. These cascades vary from 50 feet to 500 feet high. Horsetail Fall is well known for looking as if it's on fire when it reflects the sunset's orange glow in mid to late February. The first waterfall guests to Yosemite National Park often see is Bridalveil Fall. The waterfall roars during the spring and takes on a light, swaying flow during the remainder of the year. Yosemite National Park contains three groves of ancient, enormous giant sequoias. From spring until fall, the Mariposa Grove, located close to the South entrance, is the most easily accessible. The Merced and Tuolumne Groves are closer to Crane Flat and are smaller than Mariposa Grove. Glaciers and rivers, over thousands of years, carved through granite to create the Yosemite Valley, around 3,000 feet deep into the rock. Astonishing rock formations were formed by the valley's nuances. 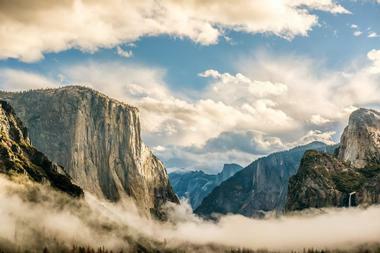 The possibly most recognized rock formation in Yosemite National Park, at almost 5,000 feet tall, is Half Dome. Some visitors choose to rock climb or hike to the top of the rock. Half Dome is one of the park's most sought after landmarks. El Capitan, reaching more than 3,000 feet high, is a favorite among more experienced rock climbers. Three Brothers is another rock formation found in Yosemite National Park, found east of El Capitan. The formation is comprised of three peaks: Eagle Peak, the Middle Brother, and the Lower Brother. Eagle Peak is the uppermost "brother." Glacier Point is known best for the view guests are given from the top of the rock formation. The cliff itself, however, is also remarkable. Crane Flat is a delightful meadow and forest area within Yosemite National Park. Visitors will find the Tuolumne Grove and the Merced Grove of Giant Sequoias in this area. Both of these ancient, giant sequoia groves have around two dozen mature giant sequoia trees. Within Crane Flat is the Crane Flat Snow Play Area. The play area offers guests an opportunity to sled or play in the snow. The Snow Play Area is located near the Crane Flat Campground, and is only open when there's a sufficient amount of snow on the ground. Breathtaking views of the Yosemite Valley, Yosemite Falls, Half Dome, and the area's high country can be found at Glacier Point. The overlook is accessible by vehicle from around late May until October of November. During the winter and early spring, cross-country skiers are able to admire the views as a reward for skiing the 10.5 miles to the viewpoint. The trip is possible to do in a day, but it is 21 miles round trip. Visiting skiers can choose to stay in a ski hut that is available during the winter. Hetch Hetchy Valley is tucked away in Yosemite National Park's northwest corner. The valley is wonderful to visit during any season. The area has one of the longest hiking seasons in the park thanks to its location at 3,900 feet. Roaring waterfalls can be heard and seen in the springs, along with colorful displays of wildflowers. The temperatures can be high during the summer, but those who brave the heat are rewarded with beautiful peaks, secluded canyons, isolated lakes, and vast wilderness. Wapama Falls is accessible by a five mile, round trip hike that follows along the reservoir's shoreline. Visitors start the hike by crossing the dam and passing through the tunnel. The trail has moderate uphill and downhill changes and provides amazing views of both Wapama and Tueeulala Falls. Poopenaut Trail is located four miles past the valley's entrance, and is a strenuous two and a half mile, round trip hike leading to the Tuolumne River. The trail has an elevation gain of 1,229 feet. The highest point in Hetch Hetchy Valley is Smith Peak, with spectacular views and two trails. The first trail begins at the entrance to the valley, and is sixteen miles round trip with an elevation gain of 3,300 feet. The second trail starts about six miles past the valley's entrance station. This trail is thirteen miles round trip and has a 3,700 feet elevation gain. O'Shaughnessy Dam, completed in 1938, supplies 2.4 million residents of the Bay Area with drinking water. The 117 billion gallon reservoir also allows two plant downstream to generate hydro-electricity. Yosemite National Park's Tioga Road provides a 47 mile scenic drive through forests and past lakes, meadows, and granite domes from Crane Flat to the Tioga Pass. Several turnouts along Tioga Road rewards visitors with spectacular, broad vistas. 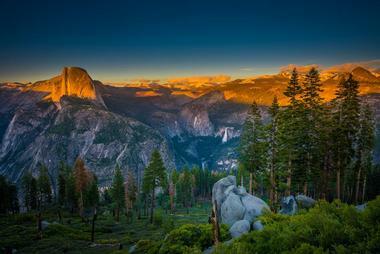 Tuolumne Meadow is a massive, open subalpine meadow surrounded by grand domes and majestic peaks. Lembert Dome, located near the meadow and north of the Tioga Road, offers a breathtaking view of the Tuolumne Meadow and the surrounding peaks. The trail to the top of Lembert Dome is short, but steep. Olmsted Point, located along Tioga Road, offers visitors a chance to look down on Yosemite Valley from the east, as well as from a quite different angle. Visitors to the park have the opportunity to explore the natural and human history of Tuolumne Meadow with a visit to the Parsons Memorial Lodge, where Robert Underwood and John Muir first had the thought of establishing Yosemite National Park. From the Tuolumne Meadow Visitor Center or Lembert Dome parking area, the lodge is an easy one mile hike. Near Parsons Memorial Lodge is Soda Spring, carbonated, cold water that bubbles out of the ground. The spring is sheltered within a historic log can enclosure. Soda Springs can be reached via a short walk from the Lembert Dome parking area. There are also lakes in the area where visitors can enjoy other recreational activities. Siesta Lake, found along Tioga Road, is an alpine lake that is great for swimming or picnicking. Tenaya Lake is also popular among guests for swimming and picnicking, as well as for kayaking, canoeing, and paddle boarding. Wawona wasn't part of Yosemite National Park until 1932, however, the grand mid-elevation basin has hosted several activities and people for centuries. The basin also contains many other natural features. The area was once home to Native Americans, then became the site of a flourishing settlement and main thoroughfare for people traveling during the late 19th century to the Yosemite Valley. The Pioneer Yosemite Visitor Center provides opportunities for visitors to walk across a covered bridge, explore historic buildings, and watch horse-drawn carriages. Stage rides are also available and some of the buildings are open for demonstrations during the summer. Guests can also visit Chilnualna Falls, which is made up of five broad cascades that slide over and through huge granite formations above the Wawona area. The falls flow year-round, with flow at its peak in May. A strenuous trail offers visitors a chance to see the cascades in several locations along the hike and provides hikers with far-reaching views that overlook Wawona. Many visitors to Yosemite National Park believe the most amazing views in the park can be found at Glacier Point. The viewpoint offers spectacular views of the high country and the Yosemite Valley, including three waterfalls and Half Dome. To the south of Glacier Point, similar views can be found at Washburn Point. However, the views of Nevada and Vernal Falls are a little better than at Glacier Point. 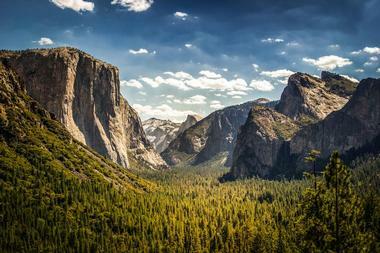 Tunnel View offers views that are among the most well-known of Yosemite Valley. From this viewpoint, visitors can spot Bridalveil Fall and El Capitan reaching up from the valley, with Half Dome present in the background. Located at the west end of HetchHetchy Valley, O'Shaugnessy Dam offers rewards guests with views of the valley's waterfalls, reservoir, and rock formations. 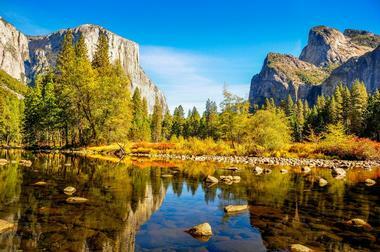 El Capitan Meadow, in Yosemite Valley, offers clear views of El Capitan, as well as an amazing view of Cathedral Rocks. Great views of Yosemite Falls can be found around Yosemite Chapel and Sentinel Meadow. For a closer view of the falls, visitors can go to the Yosemite Valley Lodge or lower Yosemite Fall. Just a short walk will bring guests to the bottom of Yosemite Falls.